This front entrance was designed by Wilson for his friend Janelle Smith. 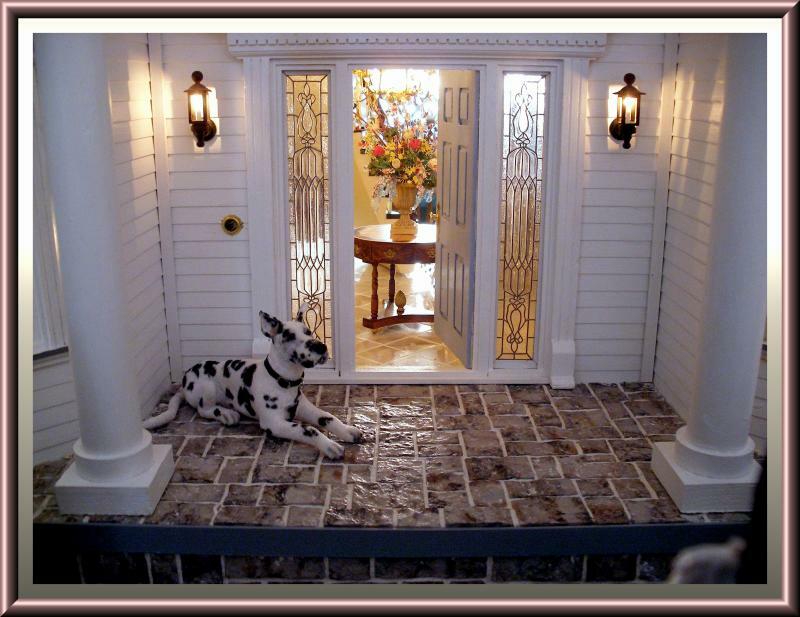 Leaded glass sidelights by Barbara Sabia, foyer table by Tony Jones, Great Dane by Lucy Maloney of Designer Dog Miniatures, dollhouse construction by Miniature Designs. The Janson Manor Living room is an elegant creation! Designed by Wilson for Janelle Smith. Wilson designed and upholstered the living room furniture as well as the Study chair. 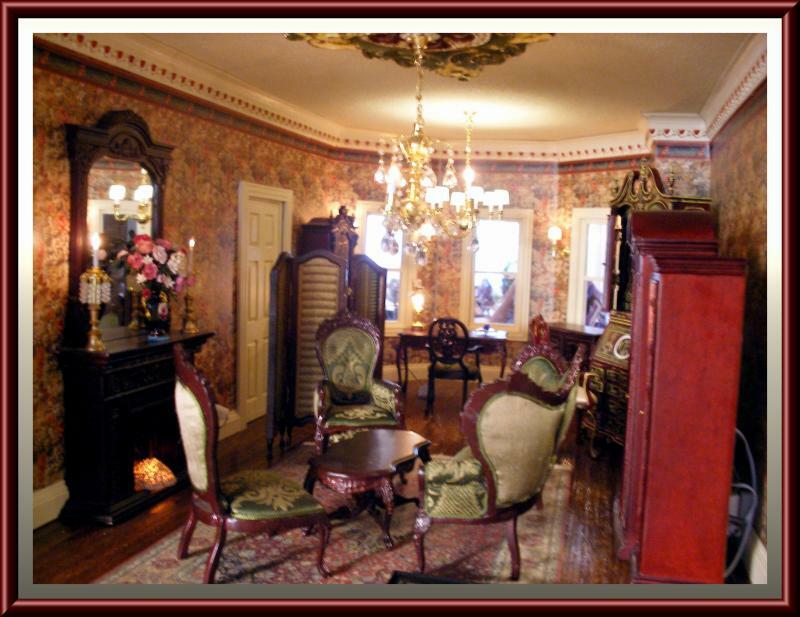 The crown molding and ceiling carvings were also painted by Wilson. The house construction was done by Miniature Designs. This Art Deco bedroom was designed in collaboration with Wilson Santiago and Myra Pierce of Georgia. Wilson designed and constructed the two story Art Deco house with Myra's ideas in mind. 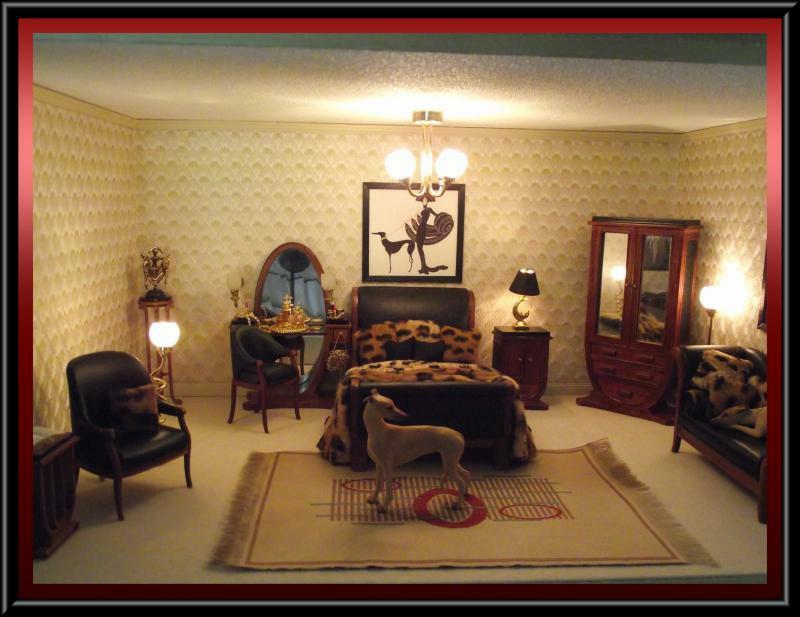 The leopard bed comforter and chaise pillows were designed and done by Wilson. 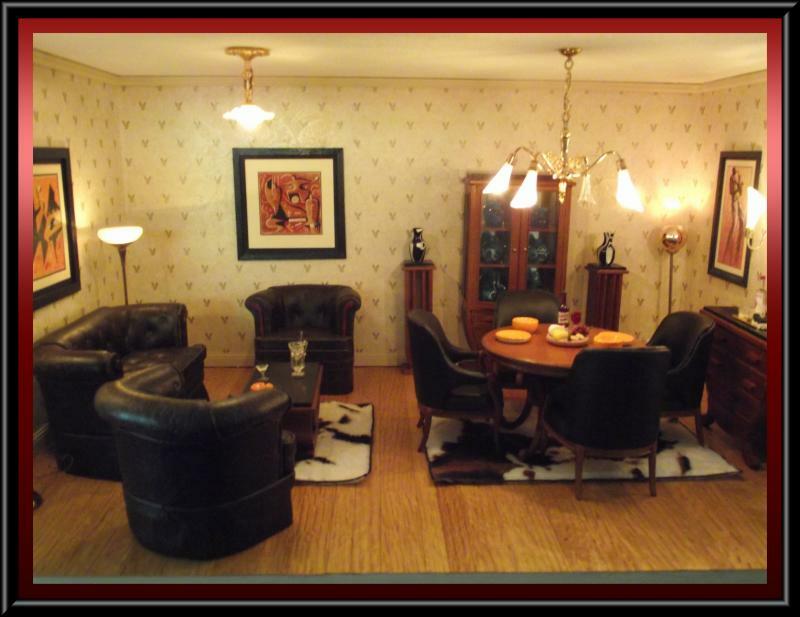 The spacious open living/ dining rooms of the Art Deco house is located on the first floor of the structure. The faux cowhide and all the prints were provided by Myra. Wilson made use of these materials to design a rug and frame the prints. 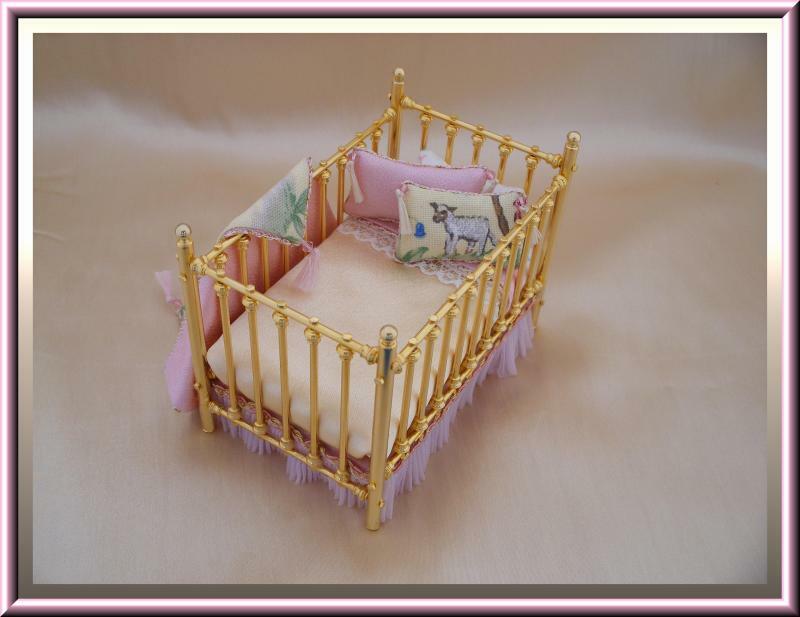 This Crib manufactured by Clare-Bell Brass Works, was custom dressed by Wilson. 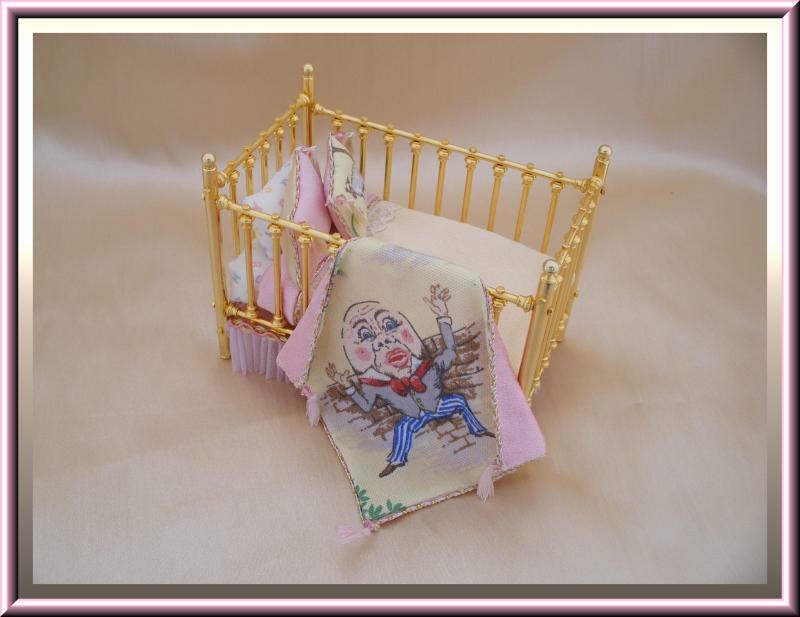 Features luxurious pink and yellow satin crib clothes and an adorable "Humpty Dumpty" baby blanket with crystal and tassle trims.